In the world of online reviews, there is no shortage of platforms that come to mind. For most businesses, there are generally three that are thought of as sites that dominate the online space and consumers attention: Google, Facebook and Yelp. In the last several years, Amazon has also become a focal point for the growing number of eCommerce businesses popping up left and right. The question many have asked is this: is there one site that’s noticeably more impactful for the reputation of your business or brand than another? The answer: yes and no — and here’s why. Google occupies 70% of the online search market to date. For many businesses, yours included, there are niche review sites that host reviews solely for the industry your business falls under. For law offices, that could be lawyers.com and avvo.com. For those in the food industry, Yelp, TripAdvisor and Zomato come to mind. Then there’s the medical field, where you have ZocDoc, Vitals.com and RateMD. Most industries have their own sites, and you should monitor any niche sites for your specific industry in addition to the big-hitters of the review world. When talking about feedback platforms the encompass a wide array of businesses, Google is likely the first site you think of. The difference that must be considered when thinking about Google in terms of reviews is that, first and foremost, Google is a search engine, and the most popular one at that. HubSpot found that 70% of the search market is dominated by Google, giving billions of people easy access not only to your website and those of your competitors, but also to your reviews left through Google My Business. Yelp has 33 million unique app visitors per month. Customers may not be looking for reviews of your business or that of your competitors, but should their search trigger keywords in your site and Google My Business profile, your star rating on Google and all of the reviews will be on display for every consumer to see. Because of this, along with their constant policy updates to ensure accuracy; Google has become a dominant and transparent platform to gauge a business’s reputation via reviews regardless of industry. Another platform that’s widely known and utilized is Yelp. At the end of 2018, Yelp reported that they had roughy 177 million reviews on the platform, and throughout last year, 80% of Yelp searches were done on a mobile device, while the trend of monthly Yelp app users continues to rise, ending 2018 with an average of 33 million unique app visitors per month. If 80% of Yelp searches are done on a mobile device, this tells us one thing: reviewers are extremely active on the platform from their mobile device, which is likely on-hand at all times. Because of smartphones, consumers have an exceptionally simple and efficient way to look up house and lawn services, new restaurants, top museums and premier shopping nearby. BrightLocal found that 86% of people look at online reviews when making purchases. With Yelp having it’s own app that predominantly exists to give consumers a level playing field with just about any business throughout a wide array of industries, it’s no surprise that their monthly app users continues to increase. With digital taking over and the “now” culture that’s been created, people want to utilize platforms that give them the most accurate information in the shortest amount of time. Yelp’s strict guidelines and policies keep the platform consumer-driven; meaning those who are looking up your restaurant, apartment complex or even car dealership are able to access the Yelp reviews of previous customers experiences with a few taps on their mobile devices. Amazon allows its customers to not only review products, but also the sellers. In terms of eCommerce, Amazon has quite the grip on the review market. Whether your product is sold primarily and solely on Amazon, or there are resellers of your product through Amazon, there is no denying the weight an Amazon review can have on your product and business overall. With nearly 2,975 new sellers coming to Amazon per day this year, along with a total revenue of 232 million dollars in 2018, Amazon is undeniably the largest online retailer in the world. Amazon allows its customers to not only review products, but also the sellers. With 9.6 million seller feedback reviews left per month, Amazon is shedding light not only on the quality of the products sold, but the experience given to the customers by each individual seller, as well. With the numerous review sites that exist and the plethora of reviews connected to your business, it can be difficult trying to gauge what site to spend the majority of your time monitoring. At the end of the day, everyone’s a customer to someone, and that’s something ReviewPush understands. With the ReviewPush solution, your business can monitor multiple review sites that your business is associated with and places every review, regardless of its origins, into one easy-to-use dashboard. Long gone are the days of going to TripAdvisor or BBB, typing your business’s name in, and browsing through the hundreds of reviews on that website alone. 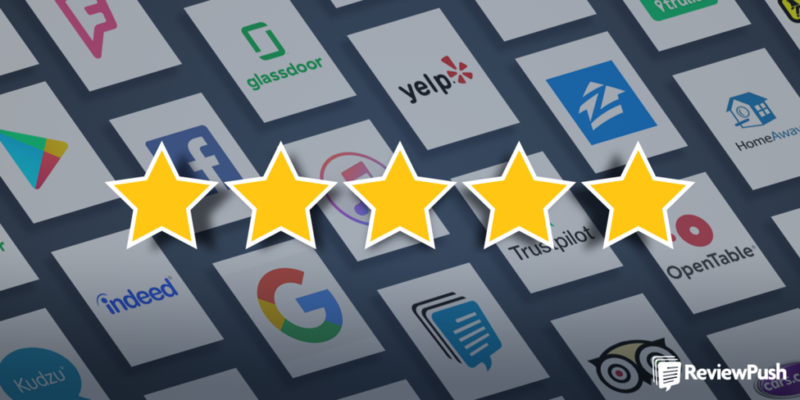 With automated solutions like ReviewPush, you can not only monitor your brand’s online reputation from one singular location, but you can also do feedback outreach to acquire more reviews on any of the sites you’ve selected to track, such as Google, Yelp and Amazon. Don’t wait until it’s too late — take control of your online reputation with ReviewPush today.